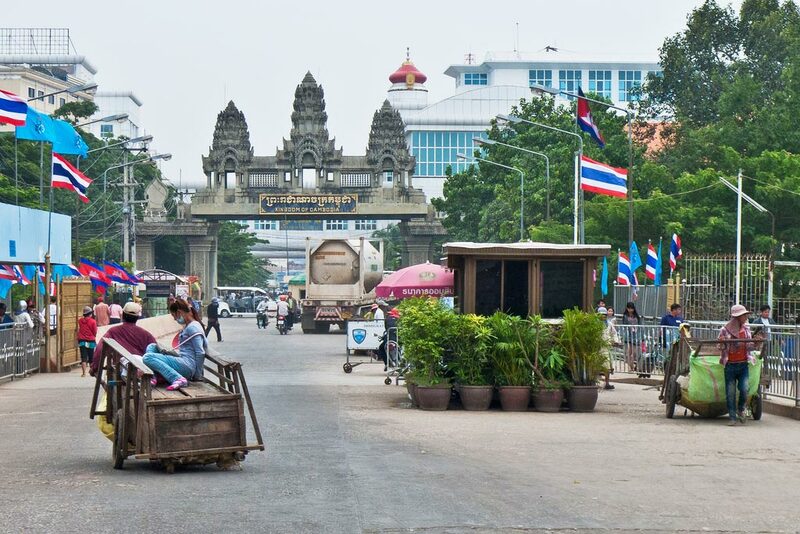 When traveling overland from Bangkok, you will enter Cambodia through the Poipet border crossing. Overland travel from Bangkok to Siem Reap is pretty straightforward. Read the following and you will feel confident to do the 465km long journey without running into any problems or scams. The whole trip takes between 7 and 12 hours, depending on your chosen mode of transport, traffic conditions and immigration queues at the Poipet border crossing. Note that only the first two travel options will bring you all the way from Bangkok to Siem Reap. The other ones will only bring you to the Thai border town Aranyaprathet (or Aran in short) from where you’ll have to continue your trip to Siem Reap individually. 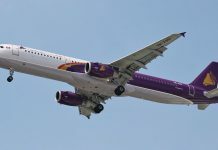 Tickets can be purchased in most travel agencies in Bangkok and prices can vary dramatically, from 300 to 600 Baht on Khaosan Road, or as much as 1000 Baht at some travel agencies on Sukhumvit Road. Shop around and bargain a little to get a price you’re happy with. Expect to stop once or twice for snack and toilet breaks. However, if the driver stops right before reaching the Cambodian border at an official-looking building with a big sign saying “Consulate-General of the Kingdom of Cambodia”, this is not the official visa office, so don’t get your visa here. More details on the following page. When you arrive at the border, cross the Thai immigration and apply for the Cambodian visa and afterwards cross the Cambodian immigration. If you are shown to a row of desks under a tarp before you go into the visa office, this is okay, usually the staff here will give you the visa form, explain about the photographs but should not ask for any money. From here enter the building and in 5-10 minutes you will have your visa. Don’t be surprised if asked for an extra few dollars at this point. 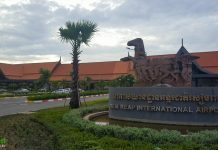 Once you are on the Cambodian side of the border, you will be put on a shuttle bus to the Poipet bus terminal, from where you continue your trip to Siem Reap. 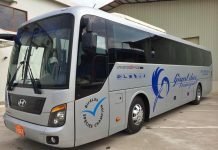 The Bangkok – Siem Reap direct bus line, organized by Transport Co. on the Thai side and Nattakan on the Cambodian side, offers three daily connections between Bangkok and Siem Reap. The bus departs in the morning from the Mo Chit (Northern) bus station in Bangkok, located close to the famous Chatuchak weekend market. Departure times are 8am, 8.30am and 9am. Tickets can be purchased online by credit card or Paypal on CamboTicket (US$28). The whole trip takes about 7 to 8 hours. The bus is air-conditioned and there’s a toilet on board. Snacks and lunch are served as well. No need to take your luggage when arriving at the border, but make sure to take your valuables! At Thai immigration, you’ll have the privilege to use the fast lane (which is a big benefit in the busy high season)! Once passed the immigration check, you can arrange your visa at the official Cambodian visa office. Continue walking to Cambodian passport control and get your visa stamped. Afterwards, the bus will pick you up again and continues the ride to Siem Reap, where you will be dropped off at the Nattakan Bus Station. Go to the Eastern Bus Terminal, better known as Ekkamai, for minivans to Aranyaprathet / Poipet. The Victory Monument was a central point in Bangkok from where minivans departed, for decades, now the vans operate from the main bus terminals. There is a free shuttle bus from the Victory Monument and to go to Cambodia you need the eastern bus station. You want to go early to avoid queues when you arrive at the border. The trip should take 4 hours, depending on traffic and expect an extra half hour somewhere if the driver stops for a meal break. As soon as a van is filled up with travelers, it will depart. The price per person should be 230 Baht, but be aware that this only covers the trip from Bangkok to the Cambodian border. Once you’ve crossed the border and entered Cambodia, you will need to find ongoing transport to Siem Reap. The good thing about this minivan service is that there’s no visa scam. The van will drop you at walking distance from the border. From there continue your trip individually, though you may wish to arrange to share a taxi with other travellers. Details for transport to Siem Reap in the “Poipet to Siem Reap” section. Poipet is the border town on the Cambodian side and has several casinos in a duty-free declared zone between the Thai and Cambodian immigration offices. Since casinos (and gambling in general) are not allowed in Thailand, hordes of Thai punters hit the road every day to spend their money in the casinos of Poipet. As such, there is a daily bus service departing from Lumpini Park in Bangkok organised by the casinos. Departing from the south-eastern corner of Lumpini Park from 5am onwards for around 200 Baht. You don’t need to book but it’s a good idea to arrive early, especially on the weekend. Note that if you are Cambodian (or have a Cambodian companion travelling with you), you may be denied access to the bus or have to pay extra, because it is assumed you will be travelling on and not spending money at the casinos. Similar to the minivans, there is no visa scam when using this service. More details on the next page. Travel by taxi is the fastest and easiest way to travel from Bangkok to the Cambodian border, especially if you can share the cost with other travellers. Finding a taxi in Bangkok is easy. Just wave a taxi down and negotiate a price. Depending on your negotiation skills, you should be able to agree on a price between 1800 and 2500 Baht for the trip from Bangkok to Aranyaprathet. It’s best to avoid taxis that are waiting in front of your hotel, especially if they are advertising trips to tourist destinations like Pattaya, Koh Chang and alike. Usually these taxis charge you 3500 Baht or more. Never pay your taxi driver upfront. Pay him once you reached the border with Cambodia. Make sure to have the exact amount with you in Thai Baht. It’s an old trick of many taxi drivers to say that they don’t have any change to give back to you. After crossing the Thai – Cambodian border, you’ll have to find additional transport to continue your trip to Siem Reap. This can either be a bus, minivan or taxi. Read the Poipet to Siem Reap section for more information. It’s possible to travel from Bangkok to the Cambodian border by public bus. You can take the bus either at the Northern Bus Terminal (Mo Chit) or at the Eastern Bus Terminal (Ekkamai). The Northern Bus Terminal is the best choice for buses to Aranyaprathet. Buses leave every half hour to hour from the ground floor of the terminal and you can choose between first class – 209 Baht and second class – approx. 160 Baht. At the Eastern (Ekkamai) bus terminal, buses leave every 1 or 2 hours. The fee is 203 Baht for a seat on an air-conditioned bus. The whole trip to the Aranyaprathet bus terminal takes around 5-6 hours. On arrival, there will be plenty of tuk tuks available to bring you to the border for around 100 Baht. Choose one of the drivers but be wary of a possible visa scam that he may try to pull before reaching the border. Travelling by train is a slow option, but it is cheap and a very unique experience, if you’re not in a rush. You can catch a train to Aranyaprathet from Bangkok’s Hua Lamphong train station. There are other stations further along the line, but since Hua Lamphong is the train’s departure point, hopping on here gives you the best guarantee for a good seat. There are two trains a day to Aranyaprathet. The first one leaves Hua Lamphong station in the early morning at 5.55 o’clock and arrives in Aran at 11.35 lunch time. The second one leaves in the early afternoon at 13.05 o’clock and its arrival time is 17.35 in the evening. Unless you plan to spend the night in Aran, we recommend that you take the early morning train. Expect delays. A one-way train ticket to Aranyaprathet is 48 Baht (or 1.5usd), which is an amazing bargain for a trip of 255kms! On arrival at Aran’s train station, there will be lots of tuk tuk drivers. Expect to pay 50-80 Baht for the short trip to the border. Be wary of a visa scam that your tuk tuk driver may try to pull along the way to the border. More details on the following page.